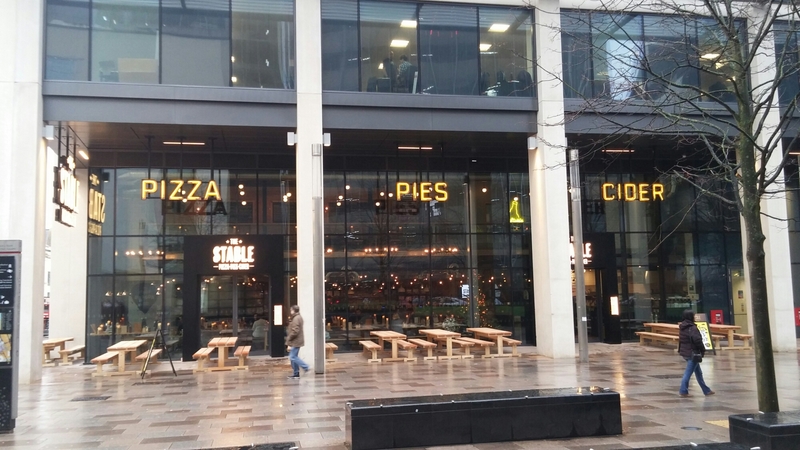 Newly opened, the Stable (under the Admiral building in Cardiff) had during its fit out a bold message proclaiming it would be “Bringing the best of the West to Cardiff”. A slightly odd statement in that, to people in Cardiff, the “West Country” where the Stable originates (and has most of its restaurants) is actually to the East. 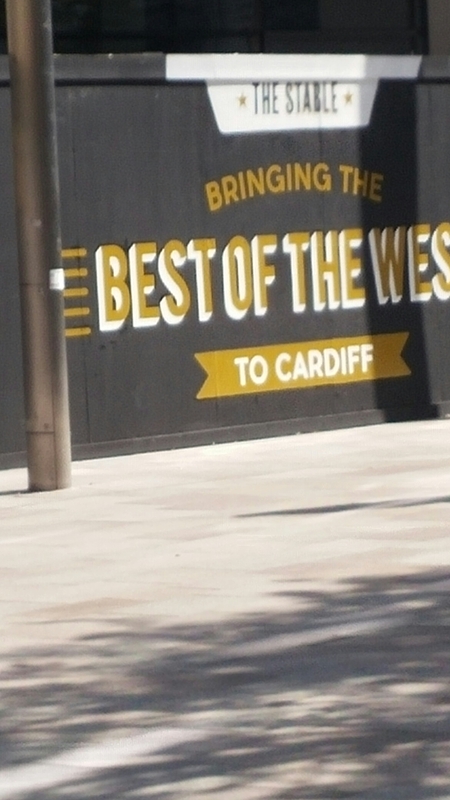 In theory, it should have said “Bringing the best of the East to Cardiff”, but that doesn’t have the same ring to it does it and it rather makes you think of a Chinese restaurant. Geography issues aside, I was keen to see whether this boast stood up (especially as, due to prior work committments with the run up to Christmas always a total nightmare on the work front, I had had to decline a kind invite to their opening night shindig) to scrutiny. It all looks very shiny and new (as it is), with a large glass frontage and communal benches inside. 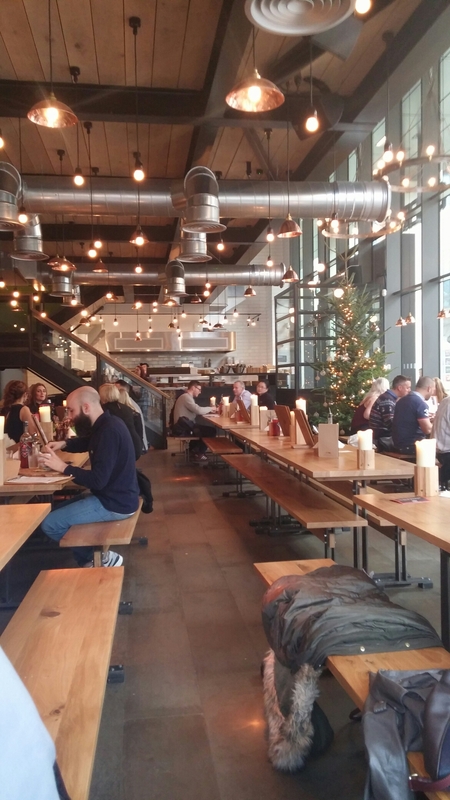 Quite industrial, but perfect for scoffing a pizza or downing a cider. Located in the same building that houses Admiral Insurance’s headquarters, I can see this place being very popular. They optimistically (in December, but then again the weather is more like May albeit a very damp one) have tables and benches outside (for smokers no doubt at moment), but come the summer this will be very nice of an evening/weekend (if the Sun ever makes an appearance again). 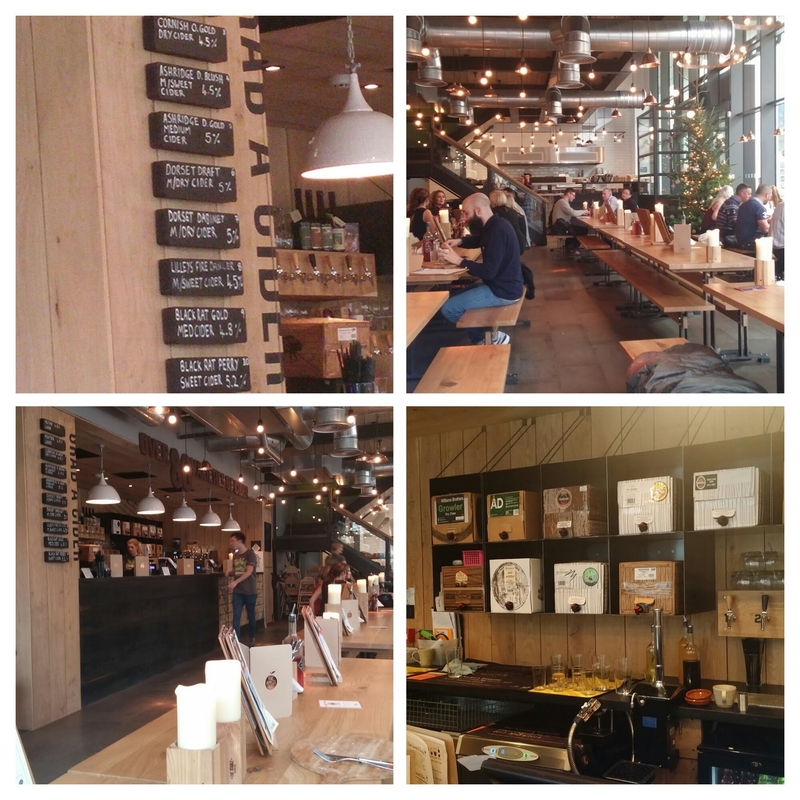 It is a nice airy space and I quite liked the communal cantina feel to it. “…… throwing out the Italian preconceptions and creating real British pizza with their own sourdough base and, what some may call, controversial toppings”. Firstly, I am of the view you can’t beat a proper Italian pizza and, secondly, to me the key to a good pizza is simplicity. Of course use top quality ingredients, but don’t have a mishmash of god knows what on top just to be clever. I have to say my heart sunk somewhat on seeing on the menu “The Severn Heavens” pizza, with smoked mackeral and smoked salmon on a tomato base with spinach and mozzarella. Great individual ingredients from impeccable sources (including the lovely smoked salmon of Severn and Wye Smokery), but together – hmmm – not sure? Having said that I had similar doubts as to a smoked mackeral topped pizza on Locke and Remedy’s menu and that turned out to be actually very nice. from the always excellent Trealy Farm (representing East Wales) and cheeses from Teifi and Caws Cenarth (representing West Wales). Alway nice to see a promise of use of local products fulfilled with gusto. Pies are the other main element on the menu, although they seem to lack the impressive local provenance of the pizzas or they are more reticient about it (doubt it somehow), which is a shame. Notwithstanding this, they all sound rather nice. 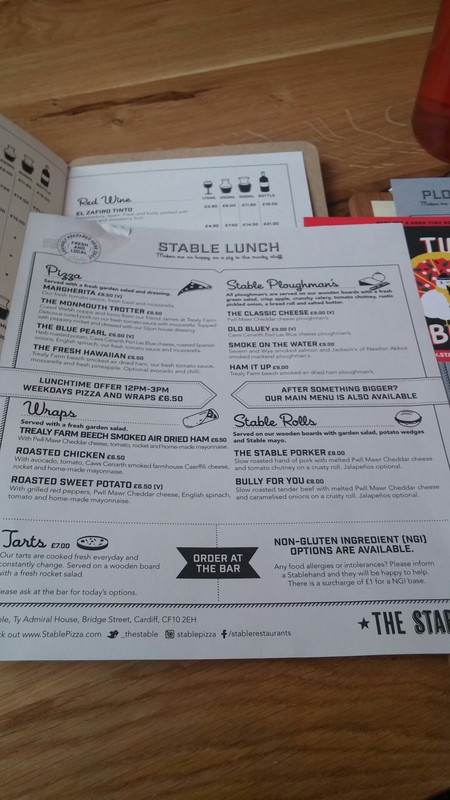 Love a good pie me and l have already heard good reports regarding the pies on offer at other outlets of the Stable. Whilst not apparent from the website (as far as I could see at least) they, pleasingly, do a lunch time menu that offers smaller “pizzas”, wraps (both for a very reasonable £6.50) and ploughmans (£9), as well as filled buns/rolls (£8) and tarts (£7 – assume a quiche sort of things, but didn’t ask as to details). 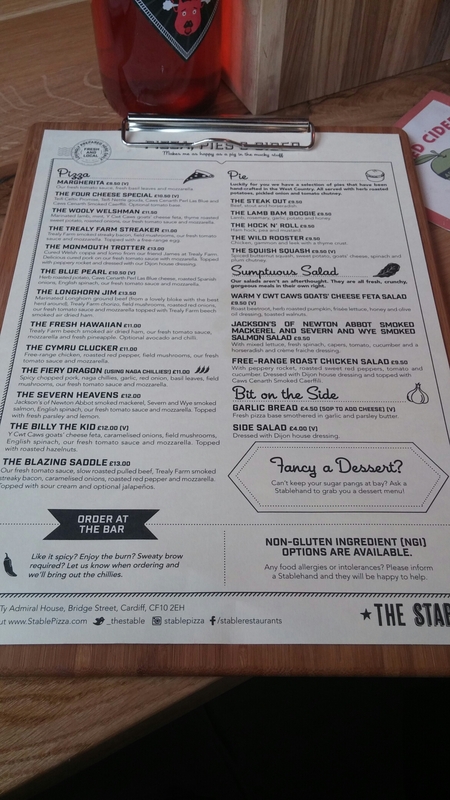 These follow the local theme of the main menu with use of Welsh meats and cheeses. We immediately defaulted to this on the basis it was cheaper (main reason) and less substantial for a lunch time meal (not wanting to feel like a post lunch nap, which unbelieveably is somewhat frowned upon in my work). Whilst tempted by the ploughmans and the filled buns (all with top notch Welsh producer ingredients), I decided on a pizza. There are 4 different pizzas on the lunch time menu and after a bit of indecision I went for the Monmouth Trotter (Trealy Farm coppa/air dried ham and lomo on a base of tomato sauce and mozzarella). The base was non – traditional and very thin, being what appeared to be a flatbread. For lunch, I quite liked this as it was light and crisp. 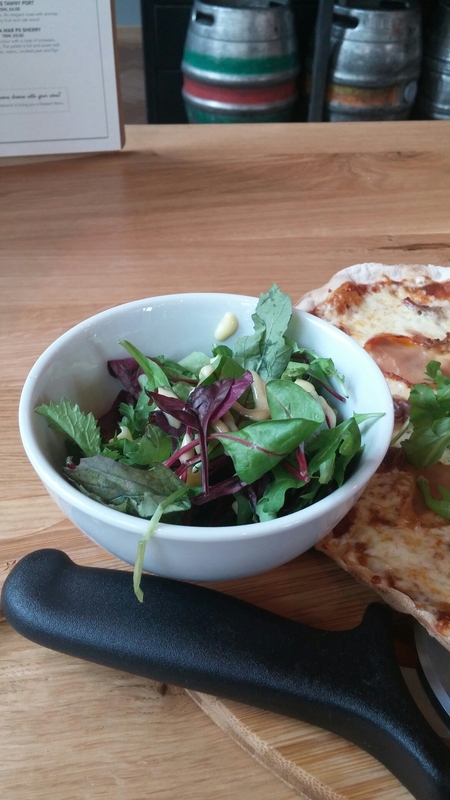 The toppings were excellent – can’t go wrong with stuff from Trealy Farm. Not perhaps a traditional pizza, but one I very much enjoyed. Both the cheese on top and the tomato base sauce ticked the boxes flavour wise. Extra of this very nice dressing was offered by the waitress and taken up by me. 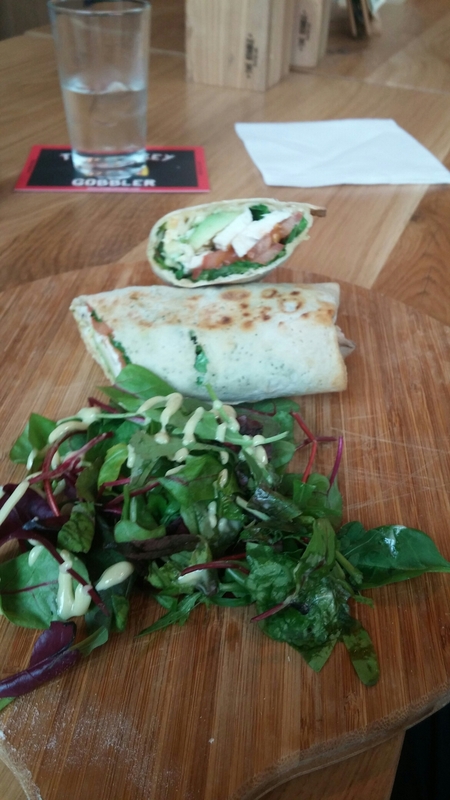 My mate had a chicken wrap, which was a generous portion and very tasty according to him. Can’t say I am that enamoured by their use of boards rather than plates, but that is just me. Here, with a pizza cutter provided for you to use, I can actually see some logic to the use of a flat board (would still prefer a plate mind). All in all a big thumbs up for the food here – with the lunch menu offering being perfect size wise and good value. Having West Country origins, this place’s focus drink wise is on cider and perry (draft and bottled) and they have a prodigious selection of both. 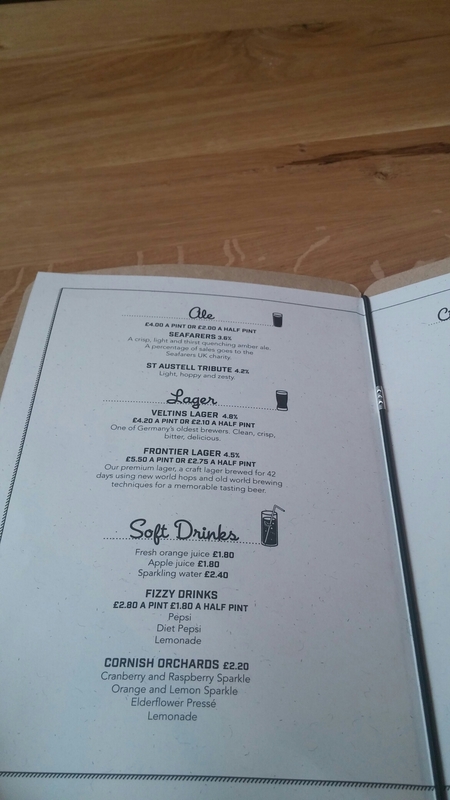 I like the fact that items in each category of drink on the menu (draught, bottles etc.) are at a set price. Makes it nice and simple. I like and can relate to simple :). 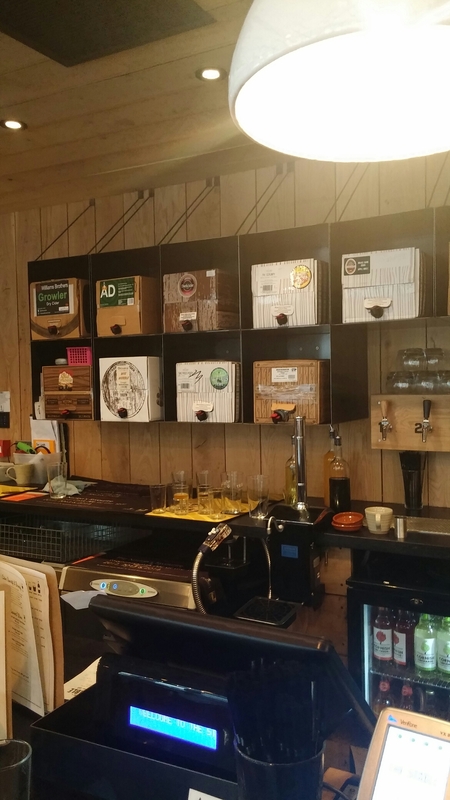 I also like the sound of their cider tasting board referred to on their website ( £7.50 for five different 1/3 pints) and despite their West Country roots there are a good number of Welsh ciders on offer. Again a real appetite for embracing local produce is evident. For non cider drinkers, there is a small, but interesting selection on offer. Wine wise, the list is short but not bad and the mark ups are not hideous. For example, the most expensive red – Ramon Bilbao Gran Reserva 2004 – has a mark up of about 100%. That, regrettably, is pretty good for the UK. Nice to see most wines on offer by the glass and carafe as well as by the bottle, but in this day and age of wine preservation options why not all of them? Alas it was a working day, so no booze for us. On the soft drink front they have a short, but well formed selection over and above bog standard sodas. 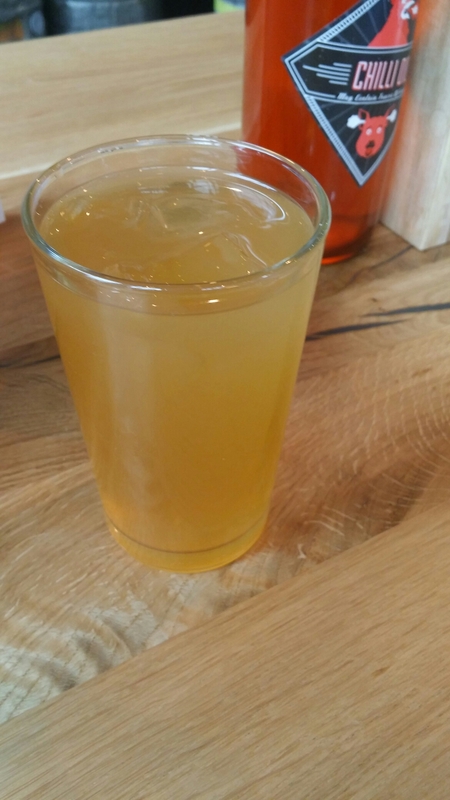 I went for apple juice, which was on tap out of a barrel and was the proper unfiltered stuff. Very nice it was too. I rather like the Stable. It offers fairly priced food (using local producers) which tastes good. The place also has a nice vibe to it, with very congenial service. Our waitress (a Russian lady) was a very happy bunny and our food arrived very promptly and with a smile. We were in and out well within the hour, but in no way felt rushed. We paid £17 in total for our two lunch time meals and a soft drink each (on top of that a well deserved tip was added). For what we got I thought that excellent value. My only slight issue is with the ordering process. You do this at the bar (paying up front and getting a table number). I can see problems with this process when it gets busy. We got lucky with no queue, but after we ordered a bit of a queue started to form due to a large group arriving. I can see in the evenings that queue getting quite long and potentially a little fractious. On the other hand, it is nice at the end not to have to wait for a bill. Would I go back? Definately, a very enjoyable lunch and I will be back for more. 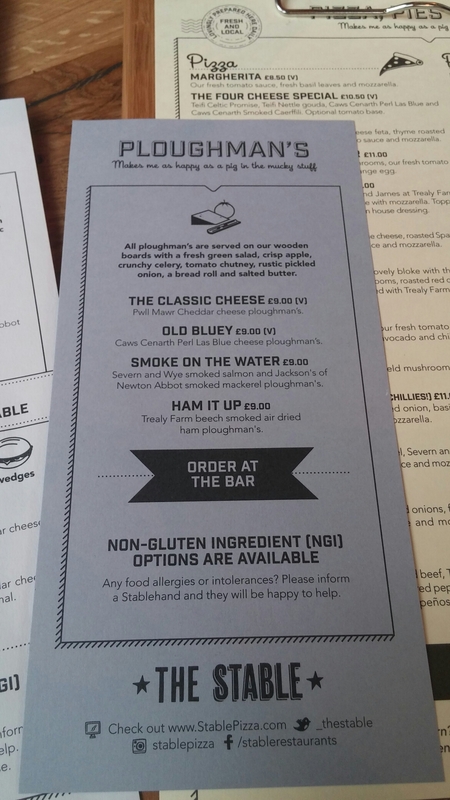 I am keen to try their ploughmans for lunch, as I spied these on other tables and they looked very nice. 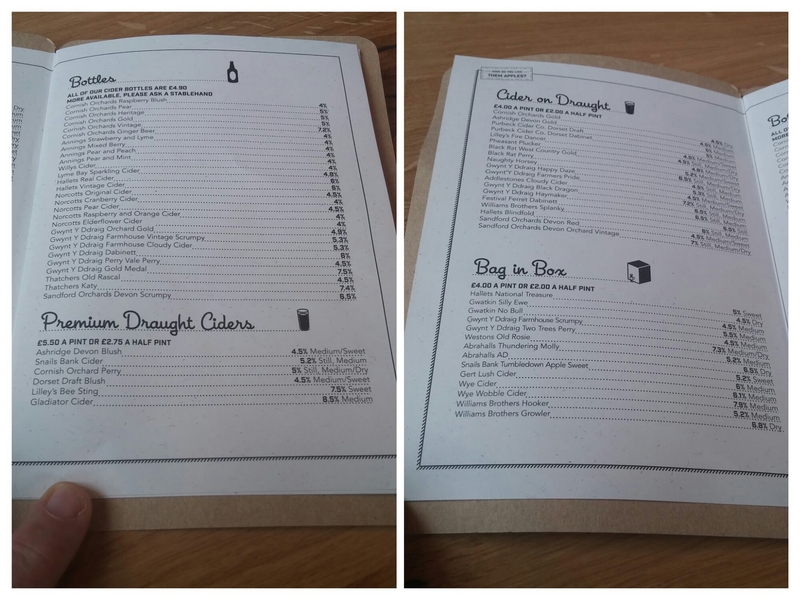 Also the wider menu looks good, as does that prodigious list of ciders. 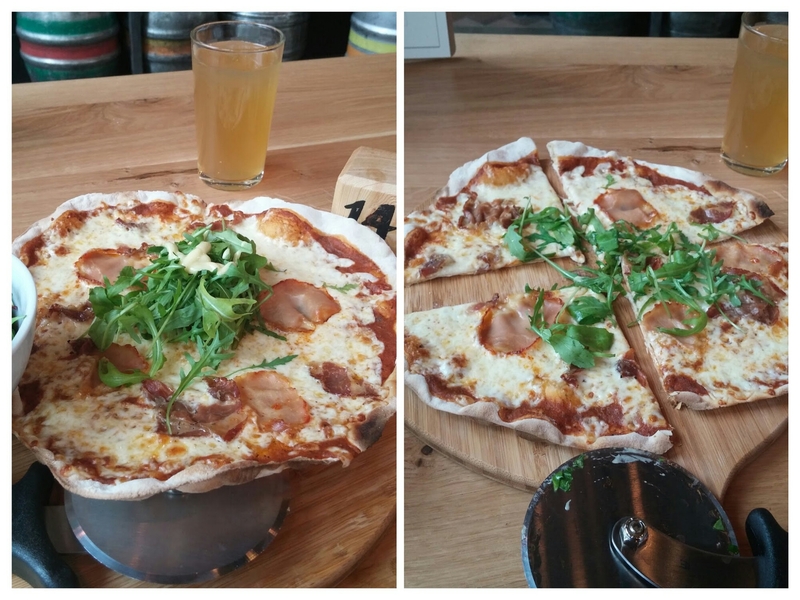 This entry was posted on Dec 27, 2015 by solicitingflavours in Alcoholic drink, Barbecue, BBQ, Beer, bitter, Cardiff, Cardiff restaurant, cider, dog friendly, Fast food, Fixed Price Menu, Food, Food and wine products, lunch, lunchtime, New restaurant Cardiff, Non alcoholic drink, Pies, pizza, Restaurant Review, review, Rioja, Sandwich, Spanish wine, The Stable, Wales, Welsh food.